Washi gonna do with today's Pick Your Plum? Washi tape coming in at $1.50 a roll. Are you kidding?!!!? Want to learn more about Pick Your Plum? Visit this feature we did awhile back. Shop Handmade Leather Journals like the ones above and leather accessories at In Blue. One of my favorite memories as a kid was creating my Valentine's box. You know, the shoe box decorated in sparkling glitter with a slot cut out in the top waiting for the perfect valentine. Did you ever create one of those as a child? Even though we homeschool, I cherish these sorts of memories and love to create them with my boys. This year we hope to plan a valentine's exchange with our homeschool co-op. I think it will be so much fun for me, I mean them. Upon my searches of wonderful things for you, I happened upon Paper Sparrow. Their original artwork is simply charming, but I fell head over heels for their Valentine's. I think you will love them too. Head over to Paper Sparrow to see more of their Valentine's and original artwork. Shop this new Etsy shop for more of Sandra's mixed media greeting cards. I love fresh white snow. I love the excitement it brings to my little boys and their cheers when making snow angels, but deep down I'm already dreaming of spring. I can't wait to select seeds for the garden, plan that first dig and welcome the warm sun daily. I long for it actually. The Gilded Bee creates these vintage inspired butterflies for embellishing gifts or crafts. I also think they would be great as little reminders of spring to come, sprinkled throughout your house. If it is flowers and buds that you dream of, The Gilded Bee has you covered with their gorgeous handmade flowers including roses, plum primrose, starflowers and more. Vintage Indie Kids has brought the kid out in me. I'm loving artwork like this from Darling Clementine. Inspired by 1950s finger puppets these images made into cards, are apart of their kids series. Another favorite from Darling Clementine are these whimsical Paris cards, in which they describe as "simple illustrations, celebrating the wonderful French language." These tags reminded me of the canning and jam making that I wanted to do so badly this year. Sadly, I haven't had the time to do so. Only one of many charming things in the Sweetly Lovely shop. Visit them today for more of their environmentally, sustainable paper designs. Congratulations to Indie Business Mew Paper Arts! Congratulations to Alissa Harvey, owner of Mew Paper Arts for her spot on CBS News. I know Alissa quite well from our Indie Wedding Guide. We've featured her DIY & Budget Friendly wedding this past Indie Wedding's Month. Head over to the link above to see the CBS report for yourself, there is also a lovely mention of Etsy. Once you've gathered all of your vintage canisters, glass jars, bowls, pitchers and any other vessel you can re-purpose for organizing, it is a great idea to give them a label or tag. Today's Daily Swank highlights a few of my favorite vintage and vintage style labels & tags for keeping things interesting and unique. 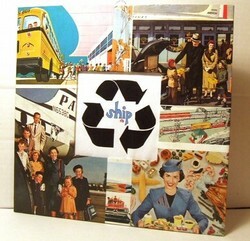 Papier Valise offers all sorts of great items like the vintage " Keep in Refrigerator" labels top left. I also love the look of vintage red and the Small Octagon Labels to your left would be fabulous on milk or clear glass containers. Papier Valise not only offers great labels for your containers, but all sorts of vintage paper stock items, trims, ribbon, millinery flowers and so much more. Just in time for Valentine's Day Papier Valise has a whole slew of treasure & trinkets like these Raspberry Fluted Sequins. They are also offering Vintage Indie™ readers a special offer! Special Offer - Vintage Indie™ Readers Only! Offer ends midnight Friday January 23rd. 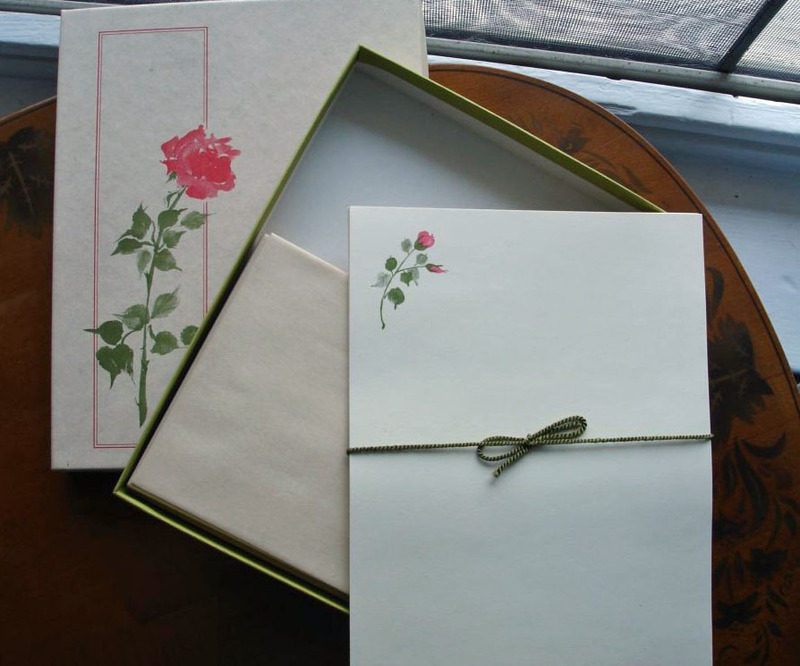 Giving thanks can be as simple as mailing a card, writing a personal note. It's often those little steps of caring that mean the most to your recipient. Today's Daily Swank are gorgeous ways to show that you care from Whatever is Lovely. As I mentioned previously I'm not so crafty, so I search out shops like Whatever is Lovely to active my goals of tears, happiness, and joy. I love this card " You're the Bee's Knees". The paper & color combo's are divine and I love the vintage image used. I can think of a dozen people I could send this card to. "Thanks for letting me be my crazy self"
From the shop - This card is perfect for that friend who loves you no matter how crazy you are. It would be a fun way to say hello. Thoughts of encouragement are often times just as important as a thank you. Whatever is Lovely does a great job creating cards that portray real-life thoughts and feelings. You won't be disappointed with their selection. Don't forget to check out their holiday tags while you are there, they are glittery goodness! Please help me in welcoming another fabulous sponsor to Vintage Indie, UPPERCASE. UPPERCASE gallery, is a storefront and web store offering an array of books and paper goods. You may have heard of them from a recent gallery and a book they recently published Old School. If you are anything like me and drool over the thought of vintage school artifacts, supplies and furniture then you will love what this book offers. Featuring 80 international artists. We are thrilled to be discussing their Eclectonotes line with you. 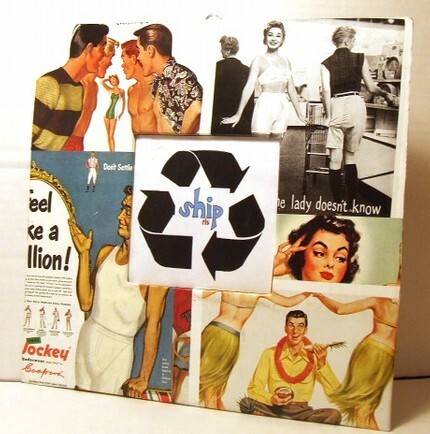 This line of paper goods are produced by hand with vintage papers and re purposed books. "“Home & Garden” celebrates interior style and home improvement with images from old decor magazines, books and even the occasional vintage wallpaper. 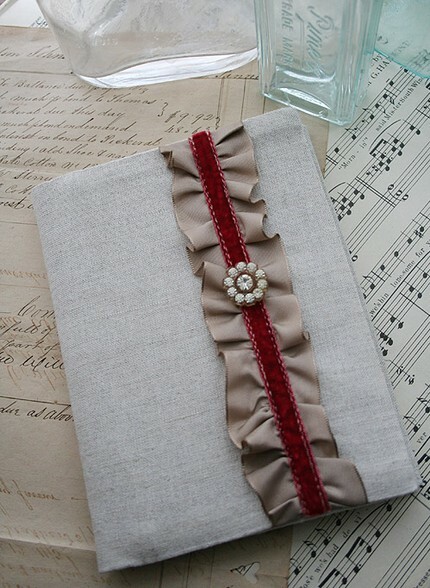 Each Eclecto is an original, one-of-a-kind notebook with authentic vintage papers." Each notebook features a transparent cover where the designs play off one another creating a completed cover. The lined pages inside are 100% post-consumer waste and all materials are fully recyclable. Another great product from the Eclecto line are these on-of-a-kind pouches. 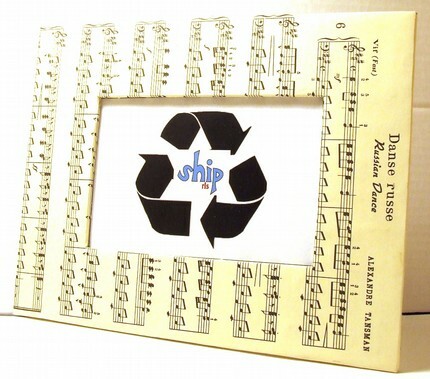 Handmade with vintage papers sewn between clear vinyl. Great for gift giving, these pouches would be great for your purse, school bag or office. 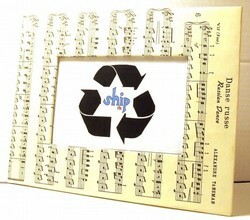 I love UPPERCASE gallery's approach to recycling and the environment. They not only provide products with style, but conscious of their surroundings and impact. Head over to UPPERCASE today for all of their wonderful, brightly colored notebooks, calendars, planners and so much more. Have you been taught " it's better to give, than to receive"? I hope you've heard that once in your life , because it is so true and such a wonderful lesson to learn. The gift of giving is something that can be done on a small or grand scale. Whether it's a courteous phone call to a friend, gas money to someone in need or recognition for hard work, no matter what you do you are changing someones life one thoughtful thing after another. Many times here at Vintage Indie I receive emails from readers who offer a gift of giving in a way they may not know truly affects the recipient. Emails filled with ooos and ahhs over businesses, handmade creations, thoughtful writings and so much more. I thought it was time to start a new feature here on Vintage Indie called "Vintage Indie Readers Give Back". We want to hear from you. Share with us an independent small business, artist, or creation that you think deserves recognition here on Vintage Indie. Be sure to include photos/links to the business or person as well as Readers Giving Back in the subject line and we'll consider it for a feature. Most of the time submissions will remain anonymous. The other day I received a wonderful email from a reader who wanted to share Susiea with you. This shop is owned by the Sacramento, California based artist Shelly Ambrogio. She immediately caught my attention with her extraordinary journals and tags. Each journal is beautifully covered and lined with exquisite vintage papers, and then she begins to paste her fairy tales with every sort of evocative textural embellishment and pretty picture of a rouged cheek lady or a rosy cheek child that can lead you off on a journey to Paris Theatres of the 1890s, Victorian gardens of 1910, or a even seaside cottage in the 1940's. She add stitches; and ribbons, laces, and buttons and bits that you just know are almost too dear for her to part with. With one look at these finely designed books I thought of a story to fill each one! I recently took a trip to Sacramento and arranged to meet with Shelly as we had become Etsy friends. She graciously took me to her home studio which was just what I'd thought... a little haven full of paper heaven! Shelly sells her journals quite soon after they list. I for one am going to keep her in business! As I'm packing for our trip, I've been making notes for loved ones taking care of our Chloe kitty and our home. I've also been making lists for what we'll need once we arrive. I'm a list writer and a note taker. I almost never leave home without a notebook or something to jot and idea on. I thought it would be nice to share with you in today's Daily Swank some cute vintage stationary perfect for taking notes, and writing to loved ones back home. 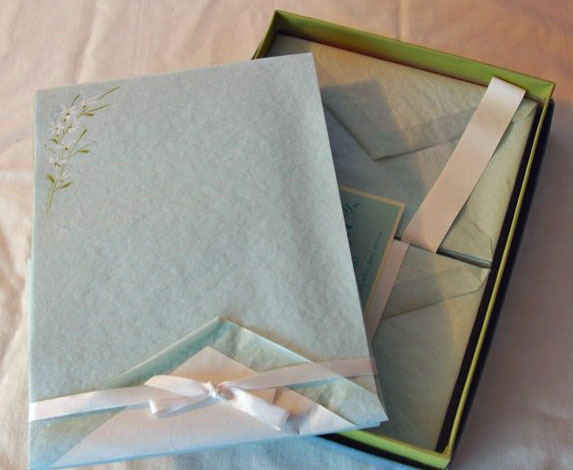 Eaton stationary set has 16 floral design pages, 18 plain blue pages, and 17 envelopes. Mother's Day Gifts for the "Oh so Chic"
It's hard not to fall in love with every single thing from Autumn To May. Today's Daily Swank only highlights a few of their glorious items, perfect for the "Oh so Chic" mom. First up from Autumn to May is this High Fashion Brag Book. It's simple, elegant and so chic. Covered in linen, adorned with velvet ribbon and an antique rhinestone button just for the right touch. Do you have a momma who loves to write and keeps a notebook with her always? This one would be a perfect addition. 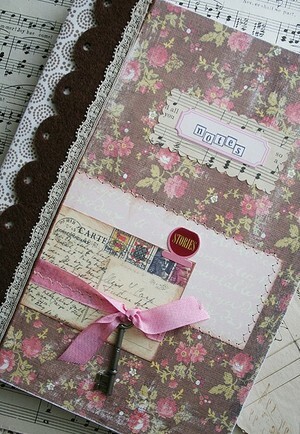 This altered and adorned Composition Journal is screaming for some attention! 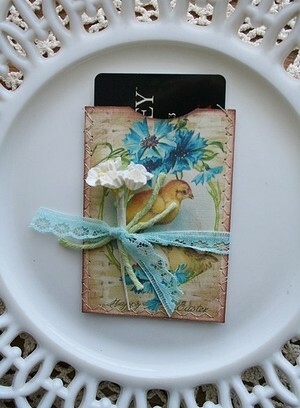 Maybe you are treating your mom, grandmother or sister with a gift card to their favorite place. Do it in style with the gorgeous line of gift card envelopes from Autumn to May. Hey Crafters! I'd like to give a huge thank you to Bley from Bibliophile for providing this amazing tutorial. 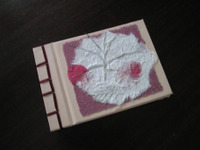 Please head over to their Etsy shop for amazing handmade journals, books prints and more. 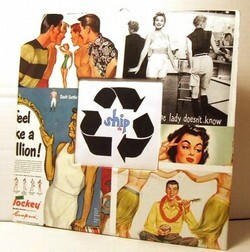 I encourage you to try new things, and use vintage or recyclable materials when you can and enjoy yourself. Gather all your materials before you start to work. Make sure you have a space where you can cut using a utility knife; an old piece of plywood makes a good cutting and work surface. All contributed content in this tutorial © Bibliophile} Please do not copy or redistribute without permission. Do you have a crafty tutorial that you'd like to share with Vintage Indie readers? Please contact me with your ideas and share with others "What You Make of It".